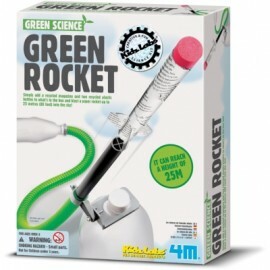 Science Museum Green Rocket - spacekids - space toys, dressing up costumes, kids spacesuits, astronaut food, cool space stuff! Catch a ride with the recycled rocket revolution with the Green Rocket kit! Make a rocket out of used plastic bottles and paper and launch it up to 25 metres into the sky. The kit includes detailed instructions on how to build your rocket - plus a few fun facts thrown in for good measure. Experiment with different bottles to see if you can beat your own record, or challenge your mates to see who can make the mightiest missile.